AAA is back to the first week of a two week taping. They’ve been quietly posting previews on Fridays of late, so check back on that. The show description for this week’s Lucha Underground spells Cueto wrong. At this point, it doesn’t look like El Rey will be doing a marathon of the series according to the upcoming schedule. (It’s just regular Miami Vice and movie showings.) Seemed like an obvious move, especially since they did it going in to Aztec Warfare. Still has time to change. Tuesday Terra is gone. I assume they’re airing only the top four from Friday Terra, but who knows after last week. 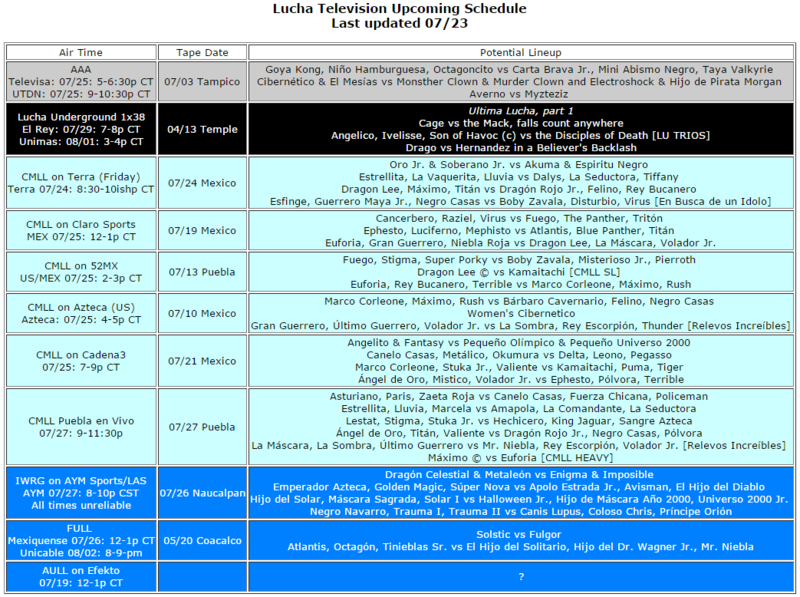 Azteca likes airing women’s matches, so I assume the cibernetico will air in some form. It really makes more sense to air than the semimain. There’s really no reason to record or post 52MX going forward, since all those Puebla shows will air on YouTube channel. I’m going to talk myself into doing it anyway, because YouTube channels go away and video files sometimes magically turn private. This is a weak Puebla show; Maximo does go into a higher gear in big matches and the semimain will be noteworthy just to see if Sombra’s allowed to wrestle. All the other trios matches are a mixed bag. Opener is the first time Zaeta Roja will make video, and it’s always nice to get a read on the new guys. if there’s no new AULL episode this week, I’ll assume it’s canceled. Blue Panther Jr. back (so if he was hurt on Friday, he was fine enough to go here.) Rudos took 1/3, the last when Esfinge unintentionally unmasked Sangre Azteca on a monkey flip. Rudos took 2/3. CMLL describes the third fall as the fans cheering for the rudos and distracting the Ingobernables into a loss. In reality, there was an incident between the Ingobernables and the fans. Security tried to pull all the luchadors away after the match and got them halfway up the ramp before Sombra broke free and went after the fans, kicking at some who had approached the ring. Rush followed, throwing back an umbrella. Police eventually got involved. Cancha has a story and cell phone video on the incident between Sombra, Rush & the fans. The video starts after the initial incident, but before Sombra & Rush go back towards the fans again. In the first fall, Mr. Niebla took a glass of beer from the fans and threw in the face of Rush. In the third fall, Rush got beer himself, tried to throw it at Niebla, and instead soaked the front row. (The article is unclear if this was Rush’s actual intention.) Those same fans, believed to be drunk, started throwing beer at the luchadors. The article says the luchadors attacked the fans after that. Ultimo Guerrero beat Mascara to end the match and security tried to pull Sombra, Rush, and Niebla away. That’s where the video picks up. Those same fans said or did something that enraged Sombra. He broke free, and Sombra kicked at them from the ring while they were standing next to the apron. Rush came in as support and threw theumbrella back at the fans. Niebla also came back in the ring and police had to get involved to break it up. The president of the local box y lucha commission, Guillermo Sandoval, was at the Tuesday show. He told Cancha on Wednesday that Rush & Sombra are suspended from wrestling in Jalisco for three months. That’d last thru October 22nd. Since CMLL DF talent are only working Tuesdays, their first show back would be October 27th. Arena Coliseo and it’s management will also be punished in an unspecified way. There probably should be something done about the security, which appeared to be insufficient for the incident, and should’ve been throwing people out as soon as they started thrown drinks at the luchadors. Maybe the outcome will be barrier are put up between the fans and the ring, like in Arena Mexico. That change seemed to occur in response to an incident between drunk fans and wrestlers too. It would require re-configuring seats to free up enough room, which would come at some cost. The easiest fix is Arena Coliseo Guadalajara being a lot more picker about who they allow to set in that front row on the opposite side of the entrances; there’s a group of about 10 seats which the luchadors end up diving in to or brawling near, and it frequently seems like the fans in those seats are drunk or otherwise unaware of what is going on. It occasionally makes for funny visuals but it’s not the safest situation. The Metalico/Leono hair match for next Tuesday has vanished. This seems to be a late decision; they were advertised as going on CMLL Informa to promote the match just minutes before the match, but their match was pulled from the CMLL website a few hours prior. I’m not sure why it was there, I’m not sure why it’s gone, I’m not sure if it’ll just turn back up. This week’s Wrestling Observer Newsletter added a few details about TripleMania and it’s PPV. The important news was on the follow up podcast: Meltzer thinks the lineup probably will be announced in full on Friday (though notes elsewhere that the announcement of the PPV was actually delayed a week.) The WON also notes AAA had previously turned down offers to do the show as a PPV in the US as to not conflict with Lucha Underground. They’re apparently not concerned about that now, and you can read in to that what you want. Hugo Savinovich will be one of the English language announcers, with the other TBD. AAA typically does Hall of Fame inductions on TripleMania. Perro Aguayo Jr. is certain to be inducted. Villano III may be honored as well. The show is scheduled to run three hours, which is shorter than most AAA shows. That probably means the event will only have six matches. We already know three (Myzteziz/Rey, Alberto/Cage, Villanos/Circus), there’s usually a Relevos AAA to get the minis/women/Mamba/Pimpi on, so that only leaves a couple matches to get a lot of people on the card. The La Parka/Cibernetico crew have to be worked in, and the guys who are seen on Lucha Underground have to be worked in. It’s going to be a challenge. The Villanos/Psycho Circus really should be kept short. There’s an autograph signing for Villano III the weekend after TripleMania, and the people promoting have implied Villano III is signing because he can’t wrestle but could really use the income. That trios match has a chance of being the least well regarded match on a major PPV, but they’re doing the Villanos a favor by giving them a good payday in a big spotlight. LuchaWorld has KrisZ’s news update and this past Friday’s En Busca de Un Idolo. +LuchaTV has a lot of new clips, including Rich Swann vs Septimo Dragon for the FIP title, Violento Jack & Aeroboy vs Ciclope & Miedo Extreo for the X-LAW Tag championship and Blue Panther building up his match with Satanico this weekend. King Jaguar is willing to bet his hair to get another shot at Lestat. A boxing and lucha libre exhibit was opened at the PRI political party headquarters. Apolo Valdes writes about Ultimo Guerrero and indy lucha libre from last weekend. 4) Hijo del Solar, Máscara Sagrada, Solar I vs Halloween Jr., Hijo de Máscara Año 2000, Universo 2000 Jr.
Panteras win the tag titles and aren’t back for the next show. Crazy Americans face off against the Navarros for whatever reason. An IWRG show. Evolution has mostly been running smaller buildings in Tijuana; this might be the first show at the big building and they’ve brought in Sombra, Rush and LA Park for it.